We guarantee natural acquisition of foreign languages from a young age. We use modern teaching methods which enhance the learning efficiency. We run our own kitchen serving healthy, well-balanced meals, tailored to children’s needs and tastes. Our multimedia room is equipped with modern equipment to make learning easy and fun. We provide transport services to and from preschool because we know how precious the time of busy parents is. We value safety: thus we provide constant monitoring accessible to our pupils’ parents. We ensure highly qualified personnel providing loving care. 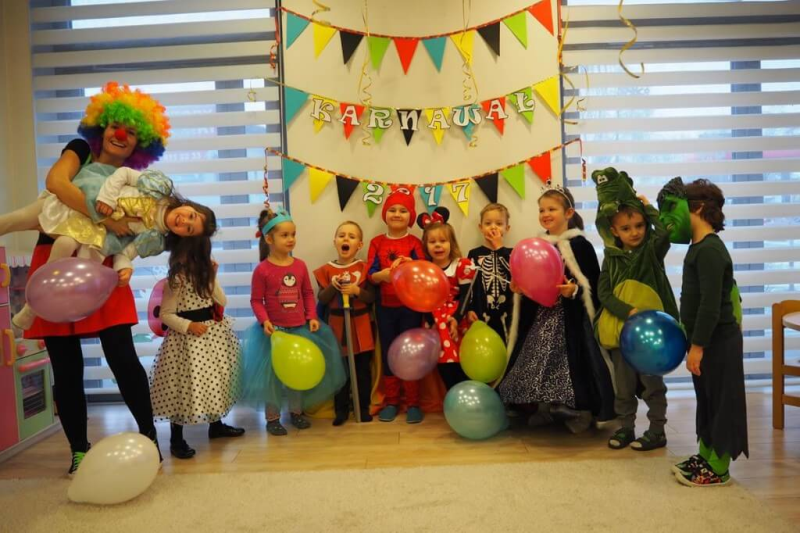 Every day, in our preschool children are discovering the world through games and various activities. Would you like to see the learning conditions without leaving your home? With us it is possible! Start a virtual walk and see what our preschools look like. We focus on interactive education! Our preschools are equipped with modern multimedia equipment for learning which not only contribute to effective learning but also make it a wonderful adventure and great fun! In our multimedia room there are tablets, interactive boards, multimedia table, seamless touch screens and a „magic” multimedia carpet. Multicultural curriculum ensures education for children from all around the world.We have classes in Polish and English. Private Language Preschool “Pod Magnolią” is open all year round from Monday to Friday from 7 a.m. to 6 p.m.